First, let me say that I love Grape Nuts (the original). It's one of my all-time favorite cereals. When Grape Nuts came out with their Trail Mix variety, I was even more excited. It's like haute couture of Grape Nuts: softer consistency to the usually over-crunchy-until-milk-soaked original; slivered almonds and a hint of what I believe is crushed walnuts; and a touch a sweetness to each spoonful. That being said, I was only slightly disappointed because the box led me to believe that this cereal would have a warm maple and brown sugar sweetness. I felt that it was missing the distinctive flavors it promised, and rather had an overall muted sweetness. I did add a teaspoon of maple syrup to my bowl - and viola! It was everything I anticipated. My recommendation is that this is a delicious cereal - a great upgrade from the usual bowl of Grape Nuts - just don't expect the maple and brown sugar to hit you over the head. And also try the original Grape Nuts Trail Mix variety with raisins. It's even better! 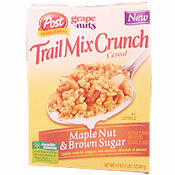 What do you think of Maple Nut Brown Sugar Grape Nuts Trail Mix Crunch? 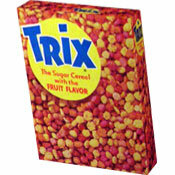 I still have dreams of this cereal. I miss it so much. Bring it back! This is one of the best cereals I have ever tasted. I like it so much, I have it for dessert before I go to bed. I am out of it and I cannot find it anywhere. It was not easy to find in the beginning so if they discontinued it because it was not popular, it is not fair. It wasn't on a lot of store shelves to be purchased. Does anyone know where I can find it. No where on the box does it say Grape Nuts or sister to Grape Nuts so if you do not like Grape Nuts and buy this cereal based upon the title and picture, you will be greatly greatly disappointed. Despite the fact that there is no flavor, the dried cat food on the inside of the box looks nothing like the pic on the box. I love Kashi and will never buy this cereal again. I buy this cereal 3-5 at a time because I eat so much of it. I had a gastric bypass 4 years ago and this is one of the best foods that works for me. Suddenly in the last 2 weeks it is gone from all shelves in the stores that I buy it at. WHAT is happening? Are you doing away with the maple & brown sugar version? I am so disappointed in not being able to find it. Please let me know the status. I love this stuff. I bought it once but don't remember where. I do agree that it doesn't have much of a maple flavor, but I like that it is subtle. I can''t find it now. I am worried that it has been replaced in my market with the Cranberry Vanilla stuff. I think all the versions of this cereal are pretty darn tasty. I love the original Grape-Nuts Trail Mix Crunch and am now having trouble finding it in the local stores. I hope that it is not being replaced my the box marked "new" which is the one with cranberries. I have tried all 3 but the original is still my favorite. I was VERY disappointed with this cereal. After taking just one bite, the entire bowl turned to mush and was virtually inedible. I agree that the maple flavor is lacking. If I had to eat this cereal, I would eat it dry, without milk. I Love this cereal, with or without milk, it is so good. Wow... not for the cereal, but for the great review above emailed to me by Kellie from Hollywood, California. Awesome job Kellie. I didn't like this one as much as her. In fact, I was really disappointed. Like Kellie, I'm a big fan of the original Grape-Nuts Trail Mix Crunch with Raisins and Almonds. This new variety doesn't even compare. This is a maple-flavored mystery. When you eat a spoonful, there's very little maple flavor... only a sort of burnt granola flavor. But if you wait... don't take another bite... just wait... you get a very big maple after-taste. It's as if this cereal was flavored with the "ghost of maple syrup". That's a pretty fun and mysterious concept, but I don't know anyone who buys a food for its after-taste. Kellie might have the right idea about adding a little real maple syrup to it. Unfortunately, that's the only thing that could persuade me to have another bowl.